At Southwell Corp, we have been selling and supporting Greyline flow meters in Vancouver and throughout BC for over 15 years. 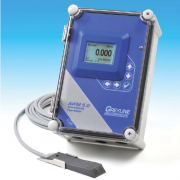 The Greyline DFM 5.1 Doppler Flow Meter is a Simple, Non-Contacting Flow Meter for Accurate Flow Measurement from Outside a Pipe. 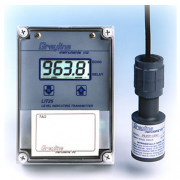 Greyline Doppler Flow Meters monitor the flow rate of dirty or aerated liquids including: wastewater, chemicals, acids, slurries, abrasives and viscous liquids. Recommended for full pipes and any fluid that contains solids or bubbles. The DFM 5.1 strap-on sensor is mounted on the outside of a plastic or metal pipe ½ inch / 12.7 mm diameter or larger. To measure flow an acoustic signal is reflected back to the sensor from moving particles or gas bubbles suspended in the fluid. Installation is easy – without shutting down the flow system. No contact is made with the moving fluid and no pipe cutting or drilling is required. There is no fouling or scale build-up on the sensor. 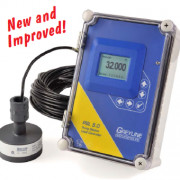 Calibration is easy with the new Greyline DFM 5.1 Doppler Flow Meter user-friendly menu system. Press the arrow keys to scroll through menus, change settings and enter calibration values. You can select English, French or Spanish menus, enable a password to protect settings and control brightness of the digital display. The DFM 5.1 measures flow in either direction and displays positive or negative values. You can control the Totalizer to subtract reverse flow, or to totalize forward flow only. The 4mA setting can also be adjusted to a negative flow setting. 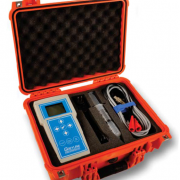 Order your DFM 5.1 Doppler Flow Meter with an optional built-in 2 million point data logger. It includes Windows software to display flow charts and tables, and to create dynamic flow reports. Just plug in a standard USB flash drive and log files are downloaded automatically – and fast! The DFM 5.1 Sensor transmits continuous high frequency sound through the pipe wall into the flowing liquid. Sound is reflected back to the Sensor from particles or gas bubbles in the liquid. If the liquid is flowing, the reflected sound returns at an altered frequency (the Doppler effect). The DFM 5.1 continuously measures this frequency shift to accurately measure flow. The DFM 5.1 Doppler flow algorithm filters out background noise and interference. The high speed digital signal processor discriminates against weak and distorted signals for increased reliability and accuracy. If the processor cannot measure accurately the meter will display zero flow. 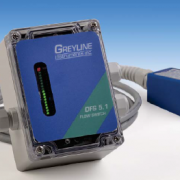 The Greyline DFM 5.1 Doppler Flow Meter includes an ultrasonic sensor, a simple 5-key calibration system, a large digital flow rate display with totalizer, isolated 4-20mA output and two programmable control relays. Data logger and intrinsically safe sensor are optional. 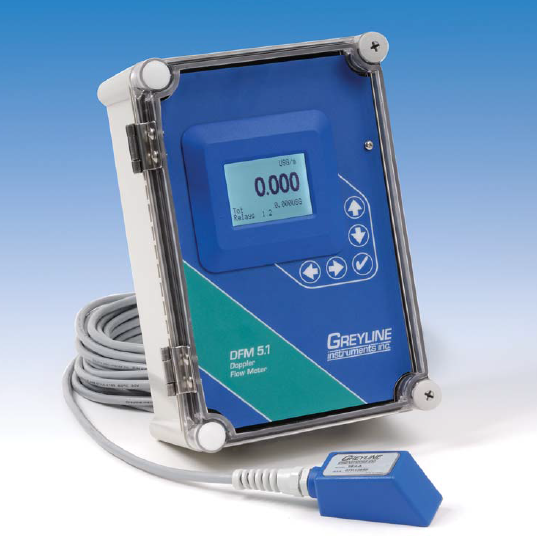 Greyline DFM 5.1 Doppler Flow Meters are available in BC through Southwell Corp.
We ship to Vancouver, Victoria, Burnaby, New Westminster, Surrey, Abbotsford, Kelowna, Kamloops, Vancouver Island, Prince George and every other town in BC. 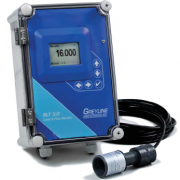 Greyline Flow Products are known across many industries as reliable sources of data for your flow systems. Discuss the specific needs of your project with one of Fiberman’s Greyline flow meter experts. We will ensure that the model you select will have the specifications required for safety and optimum performance. You will also benefit from our industry-leading quick quote turnaround and fast delivery across Canada and the US. For all Greyline Flow Meter inquiries, please call 1.844.599.0260 or email sales@fiberman.ca or Request a Quote. Our Flow Meter experts are ready to help. Fiberman’s headquarters in Western Canada stocks many Greyline Flow Meter models, ready to ship across British Columbia, Alberta and all provinces in Canada. We have daily shipments from Vancouver to destinations including Edmonton, Calgary and Fort McMurray. For our US customers, we ship from distribution centers in: Pittsburgh, PA; Houston, TX; Knoxville, TN; Rochester, MN; Salt Lake City, Utah; and Orlando, FL. Fiberman’s pricing and service experts are standing by to help to find the best product for your project. With many varieties in stock and expedited shipping, we can supply your project with flow meters at the best possible price with fast delivery. In today’s connected world, we depend on cellular telephone signals, Wi-Fi networks and over the air radio and television signals. Wi-Fi and Bluetooth connectivity are essential to on-site work environments. Steel structures significantly disrupt these signals. Fiberglass Grating is an essential part of building structures that are “electronically transparent” and do not interfere with radio frequency transmissions.